In A Lost Concert, Jaco Pastorius Sounded The Rhythm Of The City In 1982, NPR's Jazz Alive! recorded a big-band performance led by the inventive bassist at New York's Avery Fisher Hall. Engineer Paul Blakemore has remastered the tapes for a new album. Jaco Pastorius performs in 1982, around the time when Paul Blakemore engineered his concert at Avery Fisher Hall for NPR's Jazz Alive!. Known for his work with Weather Report, Joni Mitchell and Pat Metheny, Jaco Pastorius was one of the most inventive bass players in music history. He is the only electric bassist in DownBeat magazine's Jazz Hall of Fame. But like with many musical geniuses, alcohol and drugs took a toll — as did his bipolar disorder — and Pastorius ended up living on the streets. He died in 1987, after a violent encounter with a bouncer in a Florida nightclub. But new generations still discover his music. To add to Pastorius' legacy, a 1982 recording at New York's Avery Fisher Hall for NPR's Jazz Alive! 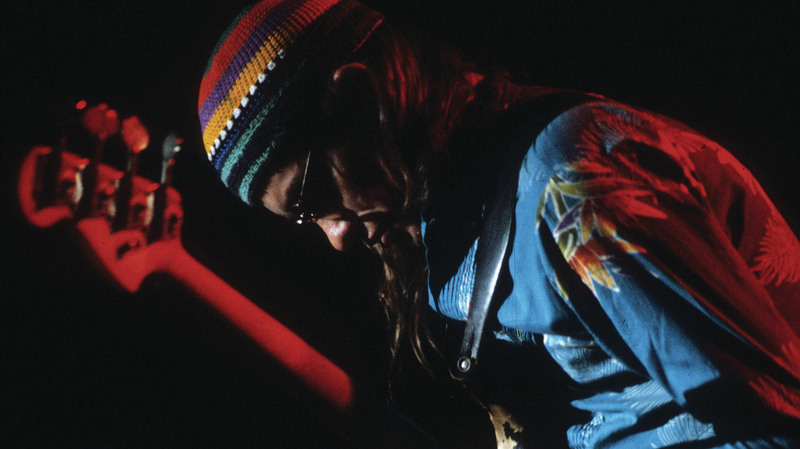 has been remastered for Resonance Records as Jaco Pastorius: Truth, Liberty & Soul. Paul Blakemore, now a Grammy-winning engineer, was the original recording engineer for NPR. After Resonance recovered the original 24-track tapes, Blakemore remixed them to capture some of the sounds and nuances that were lost in the initial mix. "The players ... were having a really grand old time," Blakemore says. "They were not standing like good choirboys and concentrating on playing right into their microphones — they were moving around and giving a great performance. And so sometimes things would go on and off mic, and with the equipment that we had to mix it originally, it was difficult — if not impossible — to fix those little balance problems ... whereas in a digital setup, I was able to go track by track and fix volume discrepancies, so that all the players are audible all the time. And then you can really hear what's going on in the musical texture." Blakemore says that when he listens to the recordings after all these years, it takes him back to the time he spent in New York after the Pastorius concert. "I had cassette tapes of the whole concert ... and I had a Sony Walkman with a set of headphones, and I would walk around New York and just listen to this music and look at the city," he says. "This music is so New York — the cacophony and the rhythm, the dramatic counterpoint of the city — it's great, great music, and it sounds as fresh to me as it did in 1982." Web editor Rachel Horn contributed to this story. In the audio version of this story, The Chicken was introduced as a composition by Jaco Pastorius — it was actually written by Alfred "Pee Wee" Ellis. Additionally, the audio version of this story incorrectly places the incident that led to Pastorius' death in Miami — in fact, that encounter happened in Wilton Manors, Fla. The same error in the digital version of this story has been corrected.